The pH runs from 0 (strongly acidic) through 7 (neutral) to 14 (strongly alkaline). Salts are made when acids and bases react together. The particular salt made depends upon the acid and base used. Pure water is neutral, and so is petrol. is a substance that changes colour when it is added to acidic or alkaline solutions. You can prepare homemade indicators from red cabbage or beetroot juice - these will help you see if a solution is acidic or alkaline. Litmus and universal indicator are two indicators that are commonly used in the laboratory. Litmus indicator solution turns red in acidic solutions and blue in alkaline solutions. It turns purple in neutral solutions. 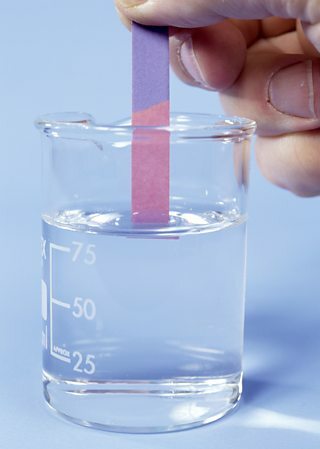 is usually more reliable, and comes as red litmus paper and blue litmus paper. The table shows the colour changes it can make. Notice how we say 'stays red'. This is better than saying 'nothing' or 'stayed the same', because it tells us the colour we actually see. , which runs from pH 0 to pH 14. Universal indicator has many different colour changes, from red for strongly acidic solutions to dark purple for strongly alkaline solutions. In the middle, neutral pH 7 is indicated by green. 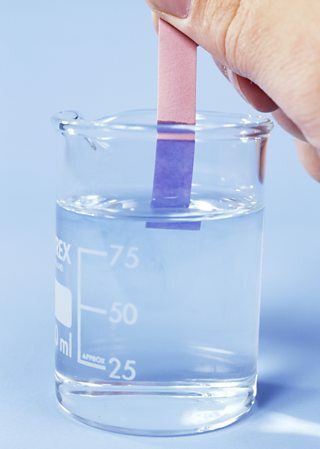 When you use universal indicator paper, you get more accurate results if you only put a small spot of the test solution on the paper, and then leave the colour to develop for about 30 seconds before comparing it with the colour chart.